One of the biggest mistakes people make is buying furniture that’s too big for the space. 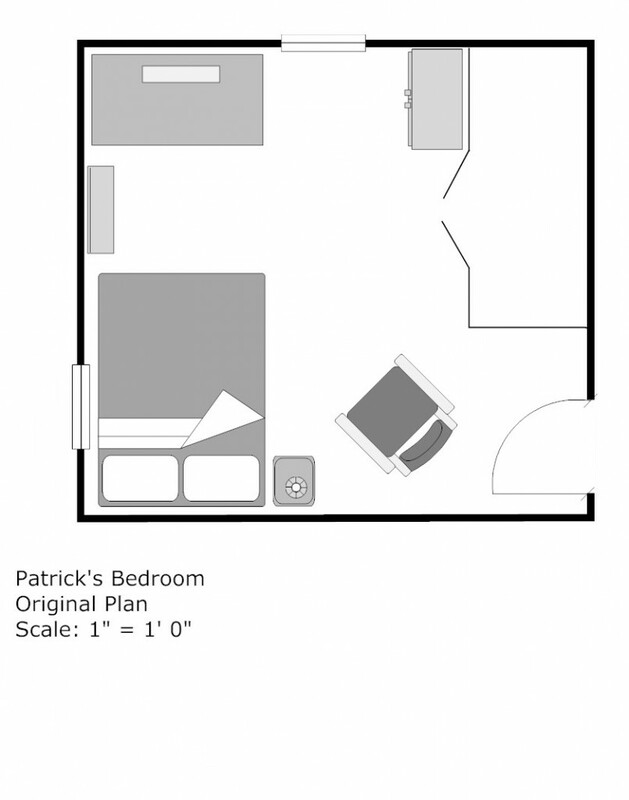 Perhaps you forgot to measure the room or the door way or the space between the windows, etc. I’ve also heard this one, “it didn’t look that big in the store”! Furniture stores should have a disclaimer posted at the front door “objects in this store are much larger than they appear”! 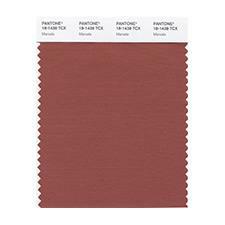 The safest way to ensure you are purchasing the right size is to do a floor/furniture plan before you proceed. That’s what professional interior designers do, come up with as many arrangements as possible for a room. You will know the exact size of each piece that will fit in the space. It’s an investment that will save you dollars. 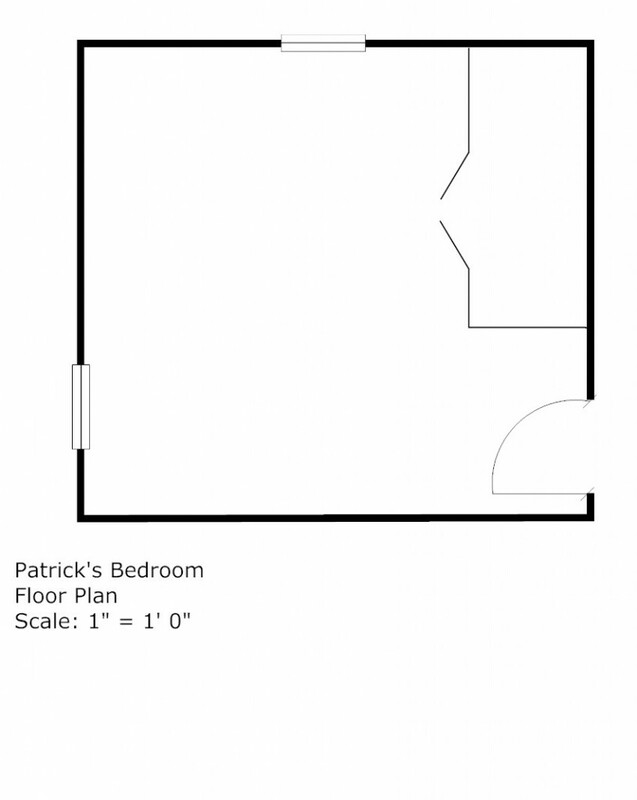 Patrick’s bedroom is roughly 13’ 7” x 12’ 8”. 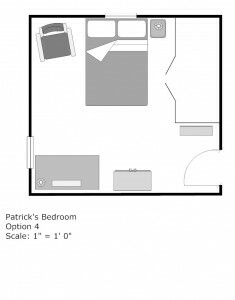 We added this bedroom when we remodeled and added square footage to our house. 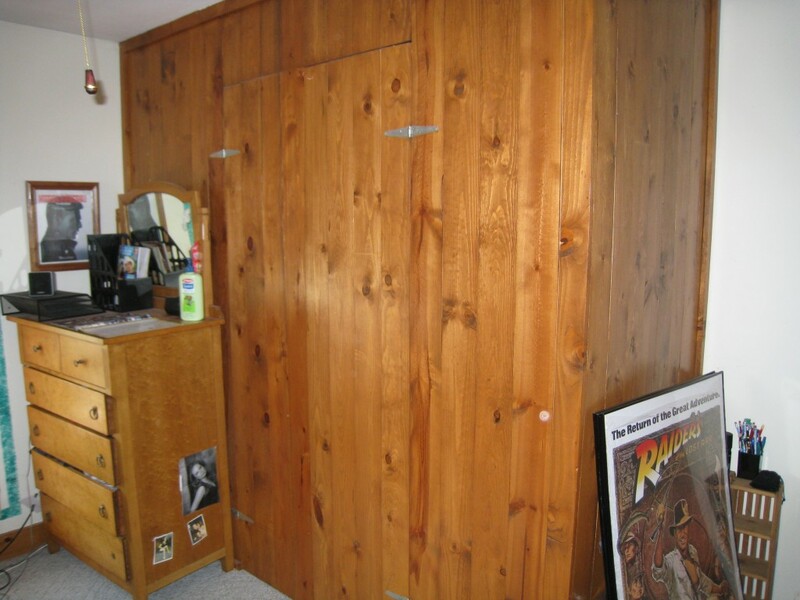 The closet is wood instead of drywall to mimic the closet in our master bedroom. Our house was built in the late 1890s, but the closet would have been added some years later. We chose wood instead of drywall for this closet to resemble another one that could be 80 years old. The new red chair was the only big item we planned to buy. The bed and desk have been in the same spot for a long time. We placed the new chair next to the bed. It’s a bit awkward since it’s a recliner and cannot be too close to the wall. Since all the furniture in the room is heavy, it’s easier to rearrange on paper than actually moving everything around. 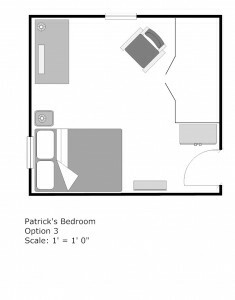 Pat has his TV on the desk and likes to sit on his bed facing the TV so this option won’t work. 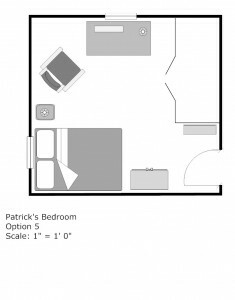 This arrangement has the bed facing the TV, but doesn’t allow much room to get into the closet. 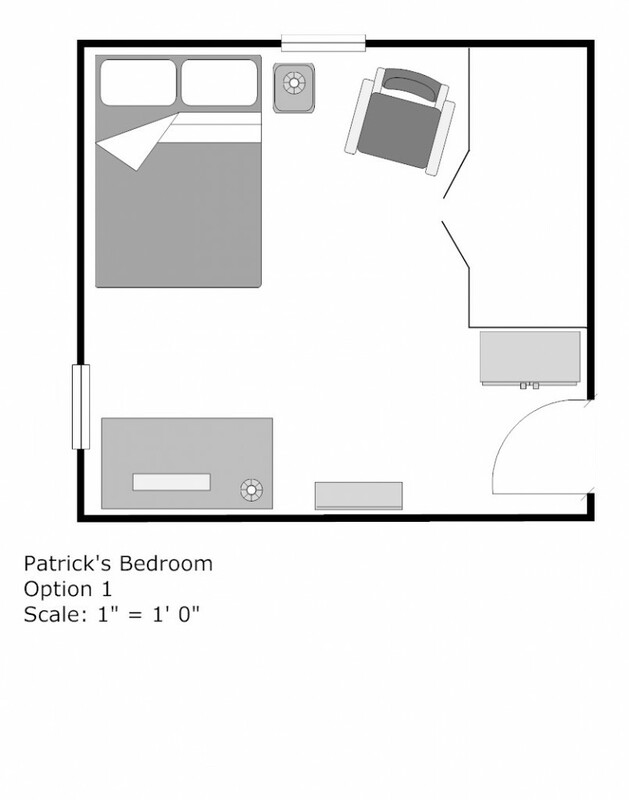 Patrick has the biggest closet in the house and he can walk right in. He would probably be OK with this option. I just don’t like a TV in front of a window even if it’s on the second floor. This option is almost a mirror image of the orginal and should be perfect for Pat. Although this arrangement isn’t much different from the original, it is really the best plan. I moved the dresser next to the empty spot near the door. 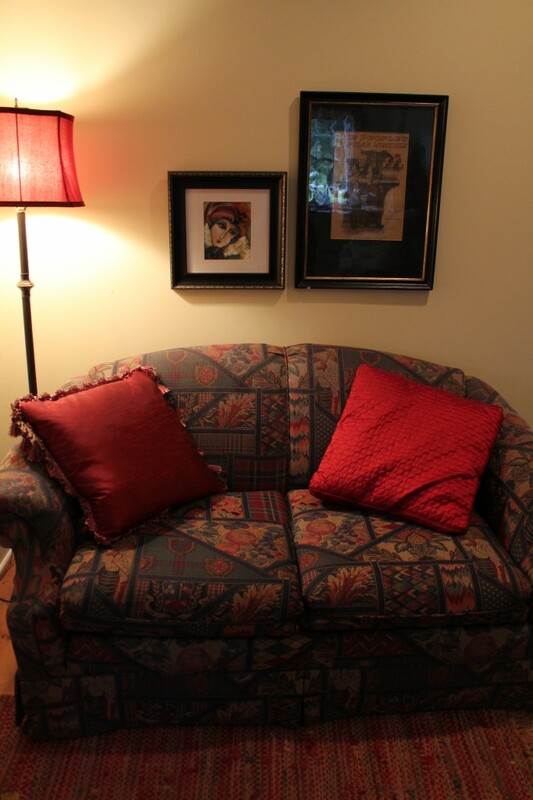 The chair will fit nicely in the vacated corner and have access to the view outside. The bed and desk have simply swapped places. The bed is no longer next to the window and if he ever decides to sit at his desk, he has another view of the back yard. You will save a lot of frustration and back aches by planning before moving furniture.